The Archbishop of Armagh and Primate of All–Ireland, the Most Revd Richard Clarke, has commissioned Mrs June Butler MBE as All–Ireland President of Mothers’ Union. June succeeded Mrs Phyllis Grothier in January 2019 and will serve a three–year term. Many supporters travelled to Down Cathedral for the service on Sunday 24 March when the Archbishop also commissioned the All–Ireland Board of Trustees. June is a parishioner of Saintfield Parish in Down Diocese and the Bishop of Down and Dromore, the Rt Revd Harold Miller, gave the address. The Bishop of Clogher, the Rt Revd John McDowell, read the Gospel. June’s late husband Kevin was Chairman of The Lindsay Chorale and it was especially poignant that they led the worship and sang several pieces. June Butler brings to her Presidency 40 years of experience in the public and private sector and her recent tenure as MU Diocesan President for Down and Dromore. She was Assistant Chief Electoral Officer for Northern Ireland from 2001–2009 and in 2011 was awarded the MBE for her contribution to electoral services in the region. 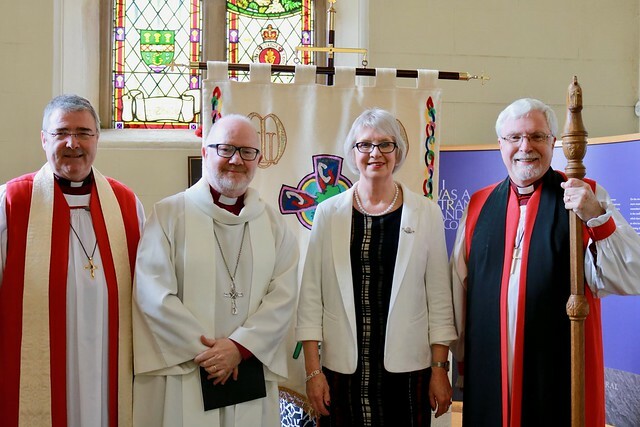 She is a familiar face at the Church of Ireland General Synod and will be known to many as the former Diocesan Secretary of both Down and Dromore and Connor. Within Mothers’ Union, June is particularly engaged with matters of policy and attended the United Nations Commission on the Status of Women in both 2017 and 2019 as part of the MU delegation. She is also a Trustee of several other bodies, including the RUC George Cross Foundation. June still finds time to enjoy her three daughters and their families including five grandchildren. Speaking after her commissioning June said: “I feel both humbled and so privileged to have been elected by the members as the All–Ireland President of Mothers’ Union. I am particularly grateful to those who took the time to travel from across Ireland to attend the commissioning service today, and also for the love and support of my fellow Trustees, my family and close friends. Mrs June Butler with Bishop John McDowell, Archbishop Richard Clarke and Bishop Harold Miller.